Thyroid cancer is generally suspected by a lump in the thyroid gland. Find out more on the causes and types of thyroid cancer from the Department of Otolaryngology at the Singapore General Hospital. ​affects more women than men. Small but mighty, the thyroid gland – a butterfly-shaped gland located at the base of the neck (below the Adam’s apple for men) – produces hormones that regulate the body’s metabolic rate. Thyroid cancer happens when the gland’s cells begin multiplying uncontrollably. What are the causes and symptoms of thyroid cancer? Who is at risk and how is it treated? Dr Constance Teo, Consultant, Department of Otolaryngology (ENT), Singapore General Hospital (SGH), a member of the SingHealth group, provides the answers. 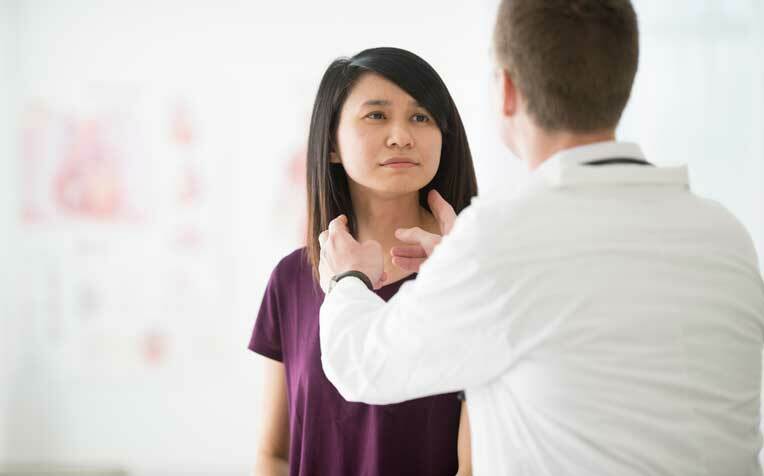 “Although in the majority of the cases, the exact cause of thyroid cancer remains unknown, studies have shown that you’re more likely to suffer from it if you have been exposed to radiation or have a family history of the condition,” says Dr Teo. Thyroid cancer also occurs more frequently in women than men, and can occur from pre-teen years onwards. Papillary thyroid cancer: This is the most common type. It tends to grow slowly but usually spreads to the lymph nodes in the neck. The 10-year survival rate for this cancer is over 90 per cent across all age groups. Follicular thyroid cancer: This affects patients of an older age group than in papillary thyroid cancer. This type of thyroid cancer is more likely to spread through the bloodstream to distant sites including the lungs, liver and bones. Its prognosis is slightly poorer than the one for papillary carcinoma. Papillary thyroid cancer and follicular thyroid cancer as a group are known as well-differentiated thyroid cancer. Generally speaking this group of thyroid cancers has an excellent prognosis especially if treated early. Medullary thyroid cancer: This tumour is uncommon. This usually arises from cells that produce calcitonin, a hormone which regulates calcium metabolism. The majority of cases occur sporadically although some are inherited through specific dominant genes associated with other hormone-producing tumours. Anaplastic thyroid cancer: This rare and most aggressive form of thyroid cancer is highly resistant to treatments for thyroid cancer and has a very poor prognosis. Read on for information on the various thyroid cancer treatment. ​What is 'Text Neck' syndrome?